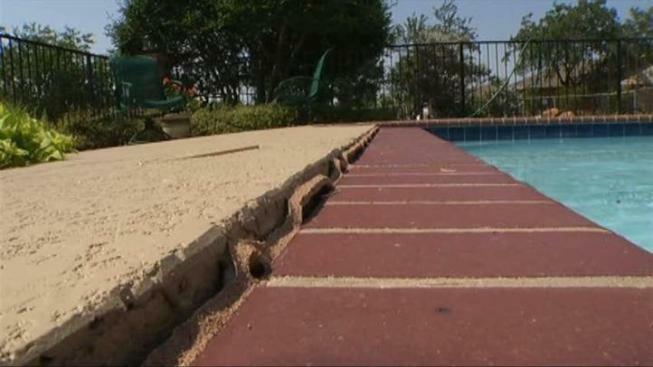 The long drought this summer has wreaked havoc on many North Texans' backyards and swimming pools. Cracking pipes and concrete are costing people upwards of thousands of dollars in water loss and repair costs. The clay soil in North Texas can shrink quite a bit in a drought, and that can cause major problems, especially for a swimming pool and deck. Bill and Laurie Lutz, of Carrollton, have had their in-ground pool for 17 years. "My wife and I still enjoy the heck out of it. We really, really do," said Bill. "It wasn't ever this bad. This is about as bad as it's ever been." Just a couple months of extreme heat and dryness has shifted the concrete around the pool. So the Lutzes brought in Ken Holmes with Leak-Tech to fix the problem. It'll cost a few thousand dollars. "It's a very bad summer," said Holmes. "You see the gap around the grout line? This is an inch and a half of movement that happened just within a matter of weeks." The shifting that you can see above ground means a more severe problem underground. "As you get soil shifting, it just puts too much pressure on the PVC pipes," said Holmes. Across DFW, pool repair companies are busy fixing broken pipes that have drained some homeowners of hundreds of gallons of water a day and hundreds more dollars a month. Simply watering your yard with a sprinkler doesn't keep it moist enough. On Holmes' advice, Bill and Laurie put down a soaker hose to let water drip into the ground around their swimming pool. Had they put the soaker hose down even earlier this summer, they might have prevented the problems they're having now. "It's very frustrating because the water bill is bad," said Bill. When the rain finally comes, the soil will expand and again, shift everything around it. So the Lutzes will wait until things settle down before getting their pool repaired.